Chiron (Alex Hibbert) is a young boy growing up in a rough neighborhood of Miami. Bullied at school and neglected at home, he seeks the refuge offered by local drug dealer, Juan (Mahershala Ali) and his partner, Teresa (Janelle Monáe). However, this respite cannot protect him from the pain in his life. Alienated by a sexuality that marks him out as being different, teenage Chiron (Ashton Sanders) finds himself on the brink between love and violence, acceptance and suppression. Adulthood brings no easy answers for Chiron (Trevante Rhodes). His new, tougher exterior hides an overwhelming vulnerability as he faces another heartbreaking choice. Jenkins explains that “it’s important people see themselves in film, but it’s even more important they see people they maybe don’t know as well”. 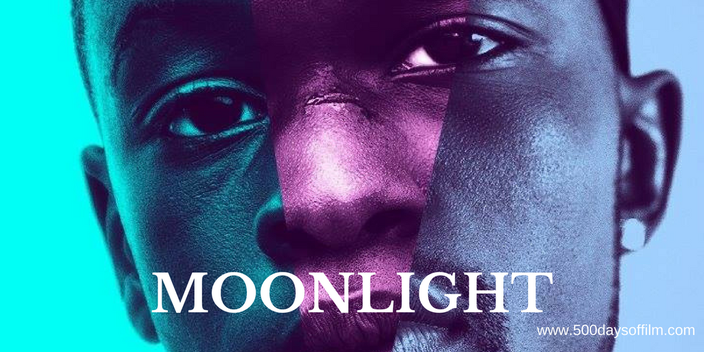 Moonlight offers us such a glimpse - into a world beyond stereotype, making us yearn for a world beyond prejudice. Jenkins leaves nothing to chance - every moment in Moonlight feels deliberate and assured. This confidence has more than paid off. For example, his decision to cast three actors in the role of Chiron could, in lesser hands, have felt jarring. Instead, it is a storytelling masterstroke. Alex Hibbert, Ashton Sanders, Trevante Rhodes are all superb. Beyond just replicating his mannerisms, they all capture the essence of Chiron. Rhodes may well get the plaudits (his profoundly moving scenes with André Holland’s Kevin reminded me of Andrew Haigh’s film Weekend) but any best actor award needs to recognise all three performances. Moonlight’s supporting cast is also extremely impressive. Janelle Monáe is brilliant as Teresa and Mahershala Ali is magnetic as Juan - peeling back the drug dealer stereotype to reveal layers of compassion and acceptance. Meanwhile, Naomie Harris is superb as Chiron’s mother. While her treatment of Chiron is heartbreakingly cruel, we also feel her love for him and understand the hopelessness and pain of her addiction. For all its harsh reality, Moonlight is also a visually stunning film. Forgoing the use of a more gritty documentary style, cinematographer, James Laxton, unifies the movie’s three chapters via a beautifully saturated colour palate with inflections of blue. The film literally shimmers on the screen. All elements combine in Moonlight, creating a beautiful and important film that will linger long in the memory. As well as reminding me of Weekend, Moonlight brought Richard Linklater's Boyhood to mind. I watched Moonlight thanks to Odeon’s Screen Unseen event. Have you seen Moonlight? If you have, what did you think of this movie? Let me know by leaving me a comment in the section below!